The Interview Coach's law enforcement and public safety coaching experience extends to all major state and federal agencies. The packages that I offer are intended to get you ready to feel prepared, confident, and to be able to answer the questions that are asked with as much ease as possible. The behavioral interview can be the most intense and challenging type of interview. It is not something you should do without properly preparing. I have coached over 2,500 candidates for various federal agencies. The packages that I offer are intended to get you ready to feel prepared, confident, and to be able to answer the questions that are asked with as much ease as possible. You CANNOT WING this interview and pass. The "law enforcement interview" varies from Agency-to-Agency. Some use "behavioral questions only," and some use a combination of questions, "behavioral as well as situational / hypothetical questions." I will prepare you to answer both types of questions, as well as many other specific questions that the different agencies use. I have worked with all the agencies and have a sense of what works with which agency. The e-Book contains exercises and information to prepare you for our work together and to get you ready to go in and "ace" that interview. I have summarized typical questions that may be asked based on the key factors that they are seeking in a candidate. 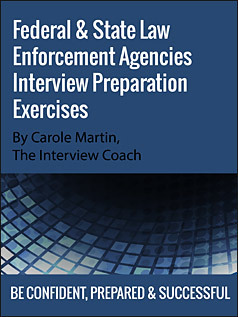 I have put together this special e-Book about the law enforcement interviews based on my expertise and training as a behavioral interviewer, and my many years doing similar interviewing - 15 years of working with FBI candidates, as well as more than 15 years working as an HR Manager. This book is an esential tool for your interview preparation. YOUR 5 POINTS SUMMARIZED and written BY ME. I personally summarize and write your 5 points to answer the questions, "Why do you want to be an agent? ", and "Why are you qualified?" TWO 25 minute recordings of me talking directly to you with tips and advice. e-Book with templates to assist you in answering both SITUATIONAL QUESTIONS. e-Book with templates to assist you in answering BEHAVIORAL QUESTIONS. TWO 25-minute recordings of me talking directly to you with tips and advice. I will critique one story written by you using the format in the materials. 20-60-20 Focusing on one of the eight factors as defined in the materials. If you want to re-write the story after my critique - I will also critique your re-write. ...THE TWO MAIN KEYS TO SUCCESS. I SEND YOU INTO THE INTERIVEW READY TO FACE THE PANEL. Which package is the best option for me? One question that I am asked often is, "Which package should I purchase?" I will be glad to spend time discussing this answer with you personally. Basically it boils down to how much time you spend with me - either coaching or writing. The Premier Preparation Package = Includes two coaching sessions with me. One ninety minute session, and one sixty minute session, plus a full critique of your stories. In this package, I personally write you a summary of your qualifications - your "5 points." The Basic Preparation Package = Ninety minutes of coaching with me, plus a full critique of your stories. In this package there is a template for you to write your own summary of qualifications - your "5 Points"
The Self Preparation Package = No interaction with me. This self guided option will help you get prepared but will take more effort on your part. The decision of which package to purchase, depends on your needs, budget, and desire to invest in yourself. I will do everything I can to get you through this process regardless of the package you purchase. And, I can honestly say that clients who purchase any of the packages have very high success rates. Here are some examples of feedback I've received from people interviewing for various agencies. FEDERAL AIR MARSHALS "I took my panel interview yesterday morning. Without a doubt in my mind, your help assisted me in passing! There were 10 people scheduled at the same time I went and the other nine applicants all failed. The FAMS panel told me that the failure rate was about 85% so I am confident in saying I was very well prepared because of you. The questions they asked were very close to what we practiced and I had a story in my head for four out of the five questions. The way they asked the question was a little bit difficult because each was probably five or six sentences long, so I kept tuning in to hear what they were looking for. Your service is worth every penny and I offer my sincere thanks for your help!" DEA "I was terrified about my upcoming panel interview with the DEA. After spending two hours with Carole, I felt that I could come up with a strong and truthful answer for any question the DEA may throw at me. The DEA was impressed with my answers and they gave me a commendation on my thorough preparation. I owe it all to Carole." DSS "Carole Martin's method of preparation for the Board of Examiner's Oral Interview and Oral Assessment was the critical factor in my success. I believe that I was the only one from the 8 or 9 candidates who interviewed that day who scored high enough to pass the interview stage and move along in the process. That is no coincidence. I felt very confident that the stories we developed together could be utilized for a variety of scenarios, which was exactly the case. In fact, I did not encounter a single question that caught me by surprise. That is what I call thorough preparation, and I owe it all to Carole Martin." FOREIGN SERVICE "Carole taught me the secrets of good story telling, which is the key to passing the Foreign Service Oral Interview and Oral Assessment. I was spending too much time setting up the story, and was not good at breaking the main points down into concise details, which the assessors are looking for. Carole also helped me work on a strong closing to each story. A good ending is critical, because the assessors are looking for composure (this is a stressful interview) and oral communication skills. Thanks to Carole Martin's coaching, I passed the oral assessment." FBI POLICE OFFICER "I passed my FBI Police officer exam and interview. I couldn't believe it, the exact same situations you prepared me for, they asked me. I felt so prepared. They asked me to give examples from school or work, and I told them the stories I prepared and gave them the situation, my actions and results. I have to say thanks again Carole, I couldn't have done it without you." BORDER PATROL "The Border Patrol exam was a pretty relaxed environment. The advice and coaching you provided using the FBI Phase II prep materials, especially the 5 finger technique, were an enormous help. There are similar questions asked as with the FBI...things like, "Why do you want to be an agent?" The 20/60/20 rule was extremely beneficial too...I know it was extremely helpful for me in just organizing my thoughts. I did receive my test results for that exam recently and found out I scored a 95%...passing is 70% :)"
LOCAL POLICE DEPARTMENT "I got the voicemail tonight that I passed!!!! Woo Hoo!!!! I am convinced without a shadow of a doubt that your coaching was what made the difference in the oral interview. I wasn't too worried about the written test, but the oral interview is much more important in this part of the employment process. I was a bucket of nerves when I went in, but practicing and reviewing made ALL the difference! I also went in for my Police Department interview on Tuesday (I'm hedging my bets) and SMOKED it!! It was without a doubt the best interview I've ever had. Maybe I'll get two job offers out of this? You were worth every penny and I would definitely recommend your services to anyone wishing to improve their oral interview skills." ATF "The ATF Special Agent interview went very well. The preparation that you provided me with was invaluable and I felt very confident going into the panel interview. There were many questions asked that we went over, thus I was prepared to give well thought-out answers. Unfortunately, the ATF takes a while (within 2 months) informing applicants if they passed, but I was very confident with my answers and I could tell by their smiles and gestures that I succeeded. Thanks for all of your help and I will let you know when the results are official. Other than that, be well and I hope that your business continues to flourish." NCIS "I just wanted to share the good news that I passed my interview and my information was forwarded to the NCIS HQ for more processing. The interview was a mix, but our prep on "What I Have to Offer" really helped. The remainder was not very behavioral, but I was able to adjust my stories to fit into the style of interview they went with. I wish I could tell you more, but your prep really helped! Thank you again." ICE "The interview was tough. He asked a lot of difficult questions and left my confidence shaken. I recovered after doing my presentation and then had 2 more interviews. When I told them why I wanted to work there and all about myself, I saw their demeanors change from skeptical and objective to personable and happy. I was excited to see the last interviewer actually wrote down that I had impressive interpersonal skills. He mentioned that I would be good in a leadership role. Having the 5 points you wrote made the difference." DEA "I just wanted to let you know that I passed my DEA interview. They pretty much told me within five minutes of completing it, which I wasn't expecting at all. Thanks for all of your help. I stayed calm, joked with the agents, and had a story ready for every question. I wouldn't have been as prepared if it weren't for your help. I'll definitely recommend you to others. Thanks again!" STATE POLICE OFFICER "Hey, it's the State Police guy. If you remember, I got the letter the other day telling me that I have been certified to join the next academy class! I am so glad that I made the decision to choose you as my interview coach. The material was great and above all, I was so impressed that you personally critiqued and refined my personal statement. I'm just blown away by your responsiveness through this. One note, I tried to get my buddy (interviewing for the same position) to buy package as well. Unfortunately, he didn't do it and for whatever reason, he didn't get certified. I have a hard time thinking that if he'd just have done the course (like I did), we'd be going into the academy together." DSS "I'm pleased to inform you that I passed the DSS BEX interview this week. The materials you provided in regards to the DSS were very helpful. The comments you sent me from prior candidates were accurate. For those looking to interview with the DSS, be sure to know the job for which you are applying and carefully read the advice left by previous candidates. Having leadership experience was a big plus. The writing portion was simple and straightforward. I heard that I was the only person who passed this week at my interview location. I also heard that the State Department isn't looking to hire more than 100 new agents this coming fiscal year, so the competition is tough. Thank you, again. Your coaching played big part in my success. POLICE OFFICER "I want to thank you for your help. My stories were great! Knowing how to build a story, I was able to come up with the same type of answers for the situational questions they asked. What a relief! This was a much better experience from the first time. I talked to a few guys afterwards; they just weren't prepared and went blank with their answers Thank you again. I recommended you to those guys that blew it.